CAFOD gave Marian vegetable seeds, nutrition and farming training. She can now grow food to keep her children strong and healthy. Once known as ‘the bread basket of Africa’, years of economic turmoil and climate change means life remains precarious for many. Today, 1 in 4 children in Zimbabwe are malnourished. Many families remain vulnerable to disease, malnutrition and the increasing risk of natural disasters and climate change. Donate the CAFOD Lent Appeal to help tackle malnutrition in Zimbabwe. 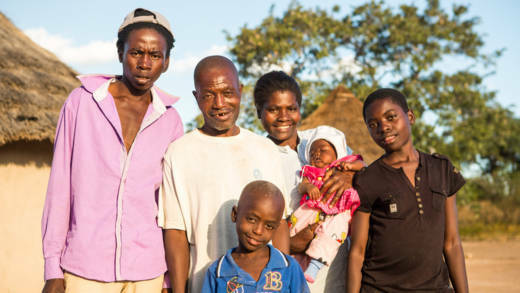 At CAFOD we’ve been supporting partners in Zimbabwe since the 1970s working in partnership with Diocesan Caritas branches, Justice and Peace Commissions and other organisations which are part of the Zimbabwe Catholic Bishops’ Conference, amongst others. 40 plus years of support mean we can better understand challenges and how to address them. Providing vital assistance to people living with HIV and AIDS, working to reduce stigma and discrimination, providing skills training and equipment to boost income and specialised nutrition and health advice. Offering specialised support to children affected by HIV, ensuring access to essential education and healthcare services and that their voices are heard both locally and nationally. Training community health care workers to reduce malnutrition. Constructing safe water and sanitation facilities for communities. Providing seeds, tools and training to vulnerable families enabling them to earn money, become more resilient to climate change, reduce dependency on food aid and improve nutrition. Helping people to get involved with local issues by taking part in processes like elections and local authority budgeting. When Marian Magumise’s children were younger, she didn’t have enough to feed them. Hunger made Marian tired and feverish, but she knew the hunger must be worse for her children. She’d leave her son Tawanda in the morning while she went looking for work, and when she came back hours later, he would still be sitting in the same place. CAFOD gave Marian vegetable seeds, nutrition and farming training, fencing off a community vegetable garden to keep it safe from livestock. Marian is now growing a range of nutritious vegetables, nuts and beans for her children. Tawanda, now 21, also has his own vegetable plot. Marian’s youngest son, Svondo, is healthy and growing well compared to when Tawanda was his age. He has a good diet and especially loves peanut butter. I’m very grateful to CAFOD supporters for what they’ve done. You have been a bridge from a place of suffering to a better world. If I were to meet you, it would be such a blessing. I’d like to ask you, what drives you to give to others? Is it your kindness? Can £28 really stop a family going hungry?